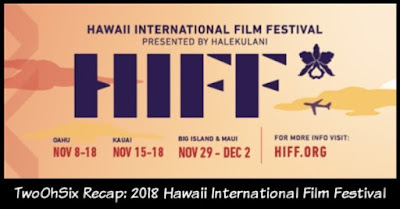 This was my third year covering the Hawaii International Film Festival remotely from my home in Seattle, Washington and each year has been such a blast I am determined to actually attend in 2019. The lineup is always filled with gems, some hidden and some more the blockbuster variety, and they come from all over the world, mostly from countries in the pacific rim. Each of the ten feature films I was able to watch during the festival were entertaining in their own way although, as always, only one was given the title of "TwoOhSix Festival Favorite." One Cut of the Dead is everything I love about watching movies. No joke, I had tears of joy from watching this film and laughed from start to finish. Congratulations to Shin'ichirô Ueda and everyone involved in creating a game changing and genre bending experience. Thank you for following along during this year's festival and please take a look at the other festivals and events that I cover over the course of the year.